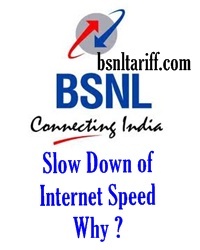 Home BSNL Broadband bsnl-news Telecom News India Are you experiencing Slow Internet Connection? Are you experiencing Slow Internet Connection? Most of the internet users are getting 1/10th of regular connection speed and users are cursing that service provider for wretched quality of service? Actually this not the fault of the Telecom Operator and not only you the user facing this slow down internet connection speed. Bharat Sanchar Nigam Limited (BSNL) affordable operator for internet (Broadband) service provider in India announced that the slow down of internet speed is due to multiple cuts of fiber cable under sea affected three major cables which are serving as the international Gateway connectivity that connect the country with many parts of the world. The Internet Connectivity is affected due to cables damage of SeaMeWe-4 (South East Asia, Meddle East, West Europe 4) resulted broken to IMEWE (India-Middle East-Western Europe) and EIG (Europe India Gateway). Bharat Sanchar Nigam Limited (BSNL) has lost 21% of its total International Bandwidth due to this disruption. Not only Internet systems and various Telecom Services like voice quality along with internet speed of various Telecom Operators services affected because of under-sea cable damage. Most of the region to the internet servers located in the United States of America (USA) and United Kingdom (UK). The maintenance work rectification measures have been already started and about to take 25 days for full restoration of the cables is under-sea. If you have been trying to stream your favorite movie on Netflix today, or download your legally purchased copy of BioShock Infinite, you may be thinking that your connection is slower than normal. In this case, the problem may not be with your local ISP but with the entire Internet. The BBC reports that the source of all these issues is a denial of service attack on the domain name servers run by Spamhaus. Its CEO, Steve Linford, claims that their servers have been under attack for over a week with peaks of 300 GB a second. Even though Spamhaus has stayed up and running, the attacks have caused Internet traffic globally to slow down. So what caused this attack? Spamhaus also hosts blacklists that are designed to stop email spam around the world. Recently, the non-profit organization used its email spam list to block servers from Cyberbunker, a Dutch-based web hosting service. Spamhaus claims that Cyberbunker is working with other criminnal groups in Eastern Europe and Russia to launch these denial of service attacks. A spokesperson for Cyberbunker did state that in their opinion, Spamhaus was abusing their power by blocking Cyberbunker but did not actually admit to being involved in the cyber attacks. We really appreciate your efforts for sharing valuable information on our website to our viewers.